Dark horse candidate who defeated Sri Lankan president Rajapaksa. His vision for the country ties in closely with the free-market, investor-friendly policies of the opposition UNP. n the biggest political shake-up in Sri Lanka in over a decade, opposition candidate Maithripala Sirisena last Friday trounced President Mahinda Rajapaksa in the tightest-ever presidential race, ending his 10-year-rule. Hailing from the rural north central province, Sirisena does not speak English, is ever seen in the national dress. He has no background of hobnobbing with the Colombo elite and socialites. No old boy of a leading Colombo school, he was more than a match for Rajapaksa’s rural appeal. While Rajapaksa’s campaign centered around his victory over the Tamils and his work rebuilding the country’s infrastructure and economy, Sirisena’s focused on reining in the president’s expanding powers. He also accused Rajapaksa of corruption, a charge the president denies. Maithripala Sirisena was a low-profile minister when a rudderless opposition chose him to spearhead a campaign to topple the president, but he become a symbol of discontent over government corruption. Mahinda Rajapakse had looked set for victory until Sirisena walked out of his government a day after sharing dinner with the strongman president. But the 63-year-old farmer-turned-politician has become a rallying point for disaffected Sri Lankans since emerging as challenger to South Asia’s longest-serving leader. He rejected the president’s accusation of backstabbing, promising to “end the Rajapakse family rule”. “What I promise is a political and social transformation,” Sirisena said at his final election rally in Colombo on Monday. Dressed in the white sarong and tunic favoured by Sri Lankan politicians, Sirisena appealed to a rural electorate while his main backer, the centre-right United National Party (UNP), is more popular in urban areas. He has pledged to abolish the executive presidency within 100 days and return the country to a Westminster-style parliamentary democracy where the Police, the judiciary, and the civil service will be independent institutions. Rajapakse had removed the two-term limit on the presidency and given himself more powers soon after winning a second term in 2010, in what critics say were signs of growing authoritarianism. The government accused Sirisena of being a proxy of former president Chandrika Kumaratunga, who came out of retirement to boost his electoral fortunes by asking her loyalists to vote for him. He said he will make UNP leader and former premier Ranil Wickremesinghe his prime minister if he wins, and together they pose a a serious threat to Rajapakse. Former army chief Sarath Fonseka, who mounted a failed bid to challenge Rajapakse in 2010, was jailed for over two and a half years on controversial charges and through an even more contentious legal process. “I know what happened to General Fonseka can happen to me too,” Sirisena repeated at the start of campaign rallies six weeks ago. It is not his first courageous political move. 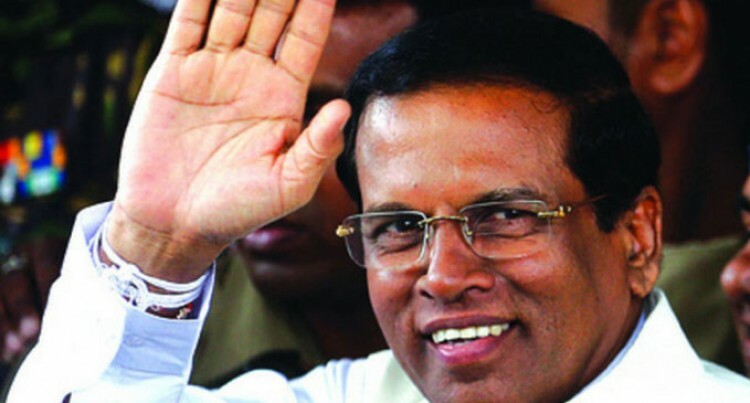 The son of a World War II veteran, Sirisena entered parliament in 1989 after settling in the eastern district of Polonnaruwa, where he had worked as a local government official. At the time his Sri Lanka Freedom Party (SLFP) was struggling to find candidates willing to risk attacks by Marxist Sinhalese militants who wanted an elections boycott. Sirisena was also a soft target for the Tamil Tiger rebels during the height of fighting and says the separatists may have tried to assassinate him on at least five occasions. Born on September 3, 1951, Sirisena joined mainstream politics in 1989 through the Sri Lankan Freedom Party. He was jailed for nearly two years after being arrested on suspicion of leading a revolt against the government in 1971 when he was just 20. After his defection from the government Rajapakse kicked Sirisena out of the SLFP. But his vision for the country ties in closely with the free-market, investor-friendly policies of the opposition UNP which provided him with the political base to challenge Rajapakse. Sri Lankan president Mahinda Rajapaksa has conceded defeat in his bid for a third term in office, his spokesman said last Friday. Rajapaska has bowed to the people’s decision and left Temple Trees, his official residence, said Wijeyanda Herath, his media secretary. In a result unthinkable just weeks ago, Rajapaksa lost to his former friend and health minister, Maithripala Sirisena, who defected from the ruling party and turned the election into a referendum on the president and the enormous power he wields over the island nation of 21 million. Sri Lanka’s Maithripala Sirisena was a low-profile minister when a rudderless opposition chose him to spearhead a campaign to topple the president. Sirisena was jailed for nearly two years after being arrested on suspicion of leading a revolt against the government in 1971 when he was just 20. The 63-year-old farmer-turned-politician had become a rallying point for disaffected Sri Lankans. Dressed in the white sarong and tunic favoured by Sri Lankan politicians, Sirisena appeals to a rural electorate while his main backer, the centre-right United National Party (UNP), is more popular in urban areas. Maithripala Sirisena has pledged to abolish the executive presidency within 100 days and return the country to a Westminster-style parliamentary democracy where the police, the judiciary, and the civil service will be independent institutions. The government has accsued Sirisena of being a proxy of former president Chandrika Kumaratunga, who came out of retirement to boost his electoral fortunes by asking her loyalists to vote for him. Maithripala Sirisena says he will make UNP leader and former premier Ranil Wickremesinghe his prime minister if he wins, and together they pose a a serious threat to Rajapakse. Sirisena’s vision for the country ties in closely with the free-market, investor-friendly policies of the opposition UNP which provided him with the political base to challenge Rajapaksa.